The future of make up has arrived… this customisable, hybrid complexion booster is quite unlike anything we’ve seen before. It offers the imperfection-blurring benefits of a primer, the mega-watt glow of a highlighter and the unbeatably perfecting properties of your favourite photographic filter. In seven versatile shades, you can wear it under, over or instead of foundation, or mix it with your favourite base products for a beautiful boost. 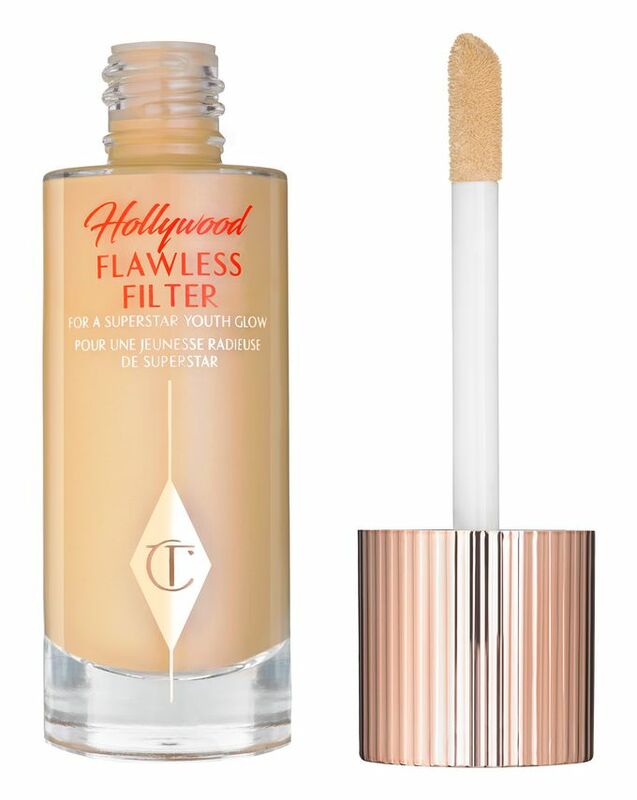 Ms. Tilbury herself calls it ‘the ultimate high gloss, high glow celebrity skin filter in a bottle’ – and as the make up artist to the stars, she should know! Another winning concoction from one of our all-time favourite make up brands, Hollywood Flawless Filter is unlike anything else in our (extensive) collective make up bag. Applying it is like adding a digital filter to a photograph – it instantly ‘lifts’ your complexion, erasing imperfections and imparting glowing radiance. Combining these filter-like perfecting properties with the blurring benefits of your favourite primer and the mega-watt glow of a highlighter, this luscious liquid imparts a dewy, soft-focus finish, illuminating skin in an instant. The magic behind the make up starts with Charlotte Tilbury’s ‘airbrush polymers’ and finely milled powders, which smooth over fine lines and pores, minimising their appearance for a flawless effect. As well as this, porcelain flower extract (rich in antioxidants and derived from a delicate Thai flower) brightens skin beautifully. You can mix it with your best base products or use it under, over or instead of foundation, or dotted onto the areas you want to glow the brightest. Apply using the ‘magic wand’ applicator. 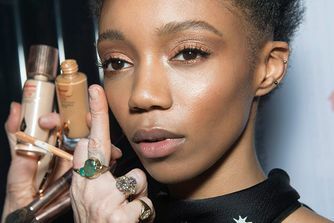 Use beneath foundation as a primer, along tops of the cheekbones, down the nose, above the cupid’s bow as a highlighter or go ‘mega-watt’ and wear it all over, erasing any imperfections for a fresh, glossy, all-over-glow! I love the product, but the packaging isn't the best since I think a lot of product goes to waste. Normal to use but different results. To tell you the truth I'm a matte kind of girl,most of the time, and my face isn't flawless either, I need foundation on me every day, but I've heard so many good things about this and how it’s a miracle etc etc that I just had to try it! Well ... it’s winter I’m not tanned so I need foundation on every day, I have my fair share of redness, blemishes etc. I don't know what I was expecting but it didn't do anything more than other primers like it do! I still need foundation on top and I don’t see anything special about it after applying it! Maybe in the summer after my face is tanned I’ll just put it on and love it without any foundation , who knows we'll see I’m waiting to try it like that, however, for now I'm not impressed! Sorry guys ! Nothing special, unless your skin is already flawless, you don’t need it, invest in a good foundation by the same brand maybe . For this price I would have expected something more balmy that keeps your skin dewy plus particles in it, but it actually leaves mine pretty dry. Good if you have oily skin I guess. People, the hype is real. If you reading this do yourself a favor and buy this. No shimmer, glitter or micro glitter..only magic. Charlotte never disappoints. If you are looking for a product that will make your skin look like it has that healthy glow, then this is it. My personal favourite way to use this is dabbing them on the high points of my face (cheekbones, nose etc) and blending it in with a Beautyblender or brush. When using it with foundation, it just makes my skin look even more like skin and so healthy/glowy. Also, love using it on a no foundation day too. You just need to try it! A real glow from within, love it!!! I'm a bit wary of adding too much shimmer to my face but was intrigued by all the amazing reviews so decided to give it a go. I didn't find it added much as a primer but I like a blob mixed in with my usual foundation or tinted moisturiser and it works brilliantly as a liquid highlighter - really makes your skin look glowing without being glittery. I have to agree with others about the bottle and applicator though - why it isn't in a pump or tube I have no idea. Yes, it gives you some glow, but only provided that you use it alone. Add some foundation/CC cream - all gone. But the most unbelievable joke is the applicator. What it says is basically: ”Here, you’ve just spent £30 on a product, so go ahead and use the 15 quid-worth amount you will manage to squeeze out of this bottle. You want more? Go ahead and pay another £30. Outrageous. I was impressed with this product and it gives a lovely, healthy sheen to the skin. Easy to apply and skin looks lit within. Good that it lives up to the hype. Bought this based on several Youtuber recommendations (Jamie Paige, Allana Davison etc.) and I have 0 regrets! It is just as wonderful as they say and nothing I know compares to this. I need oh so little for a great impact. Beautiful glow that makes me look so fresh and healthy. Love this under and over foundation or on its own even. Can make me a little oily but the glow is worth it. I use it every day and it’s truly amazing. It gives an amazing glow. If you are looking for that natural dewy, not glittery look, this one is for you. Anybody considering purchasing this product, note that it is NOT a foundation (it has no coverage), NOR a primer (it's neither tacky nor mattifying), NOR a strobe-effect highlighter. Somewhere, between those realms of word-defying cosmetic effects, lies the Hollywood Flawless Filter. It is a hybrid product, as the description declares, and multi-purpose, as the rave reviews testify. This product renders Instagram filters redundant . It is called 'filter' for a reason, let us say. This stuff makes you look healthy. My only criticism lies in the rather perplexing packaging. A pump would have been more suitable. AMAZING!!! I’ve got dry and dehydrated skin, and this both hydrates and make sure my skin glow in a healthy and natural way. Love it. I use it all over my face, and it provides a slight coverage/perfects the skin. Best product I&#8217;ve bought in a long time! After reading the reviews I decided to go ahead and try it myself and it’s honestly incredible. I’ve been wearing it all over my face with some concealer and mascara and I’ve never looked better. Gives a natural perfect glow, a few people have asked if I’m pregnant because I’m “glowing” haha. I do believe less is more with this so will last a very long time. 4 stars because of the applicator, but will definitely repurchase. This is an excellent product. When i am wearing it ,it seems and it feels like it is my skin. Unique and one of a kind. It's a highlighter but not like any other you can buy. Use on its own or mix with foundation. It's just magical and gives enough highlighter without looking OTT. Dries down beautifully and lasts all day. I use this under my foundation and this gives the most natural radiant glow. It’s like your own skin. Love it! When I received this I must admit my heart broke a little as I ordered shade 1 and when I opened it it looked way too dark (I’m as pale as paper) but I tried it anyway. I blended it into my skin and it melted in flawlessly, not dark at all! I’m left with this beautiful glow that does look like a filter on my skin. Looks just like healthy, glowing skin with no glitter whatsoever. Probably the best product I’ve ever bought and well worth the price. If anyone is on the fence about buying this then I 100% recommend you go for it. Caroline Hirons recommended this so I ordered the shade Light and I am so glad I did. It's a wonderful lotion and gives amazing light to the skin without appearing greasy or feeling heavy. It really enhances my face and I love it. Will be a regular purchase. I have a very dull skin and this lightens up my whole face! I love this stuff! I use it as a highlighter on my oily-skinned self, and as a glowy base for people with dry, dull skin. It doesn't have coverage but smooths and brightens skin without emphasising texture. It's important to choose the best colour for you - treat it as a foundation. You can use it both as a base and as a topper, as long as you don't have an inch-thick layer of foundation and contour underneath. This is a product that emphasises natural beauty rather than paints it on. In short, you can wear this on the high points of your face and not much else, then walk around feeling like Clemence Poesy on her way to the market. Ngl though, if you don't have the money, a rich moisturiser like Weleda Skin Food could provide much the same effect (just a bit glossier). But this is Charlotte Tilbury: the packaging is gorgeous, the product packs a punch, and the sense of satisfaction when you receive the parcel was worth it for me. When mixed with foundation, it sheers it out and gives it such a natural glow with no glitter, looks stunning and dewy!! Can also be layered on top without moving foundation underneath and doesn't stay too tacky so it's a definite win for me. I use it everyday and cannot get enough. Not what I expected, oxidising very quickly. It’s amazing, you have to try it. This was so good that many of my friends said that I look so hot. I bought it because of the endless recommendations on YouTube. I was expecting a real glow, it’s just suttle and occasionally settles into my pores. I have oily skin. I'll use it up but won’t repurchase. This is my absolutely favourite product from Charlotte Tilbury. I use it as a highlighter on top of my foundation and it just gives the perfect natural glow (for extra glowiness I use Becca's highlighter on top). When I used it for the first time everyone told me how lovely my makeup was. It gives you the most stunning natural glow. Love it! Lasts a long time too. Makes you glowy and flawless but still looks really natural (my freckles show through) and lasts all day. Only fault is the awkward bottle which means wasted product. I absolutely love this product. It's gives the most fresh and natural looking skin. It stays put all day and you look so healthy! Buy this product, you wont regret it! I use shade number 2, and I personally have a natural undertone to my skin. 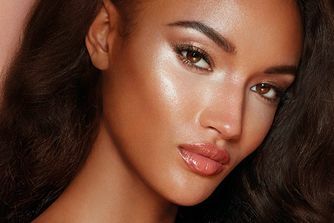 Topped over foundation on the cheekbones and you look like an effortless model with glowing skin, however underneath or mixed into foundation this really stands out! Super hydrating, which I appreciate even though my skin tends to be oily in the T-zone, It just gives your face a little something extra. A shade darker and you could use this just to bronze up your face and no foundation is needed (if you like very little coverage or just a nice glow). I was so intrigued about this product because I love glow to the skin, but natural glow, without sparkling; and in my research, I had found different opinions about this product. After trying in different ways, I should say that until today it is the best glow product for me; and contrary to most opinions found, I prefer using it before my cc cream or foundation. The face looks really nice. And to control the excess of shine in T zones, I just add a few swipes of Hourglass setting powder. Beautiful combination. Had mixed feelings when purchasing this product but oh my gosh I'm sooo glad I did. The bottle is stunning and the applicator is handy- The coverage is so sheer & glowy i prefer it on its own with a touch of highligher & bronzer for super summer / dewy skin instead of mixing with a foundation. This has defo become my beauty essential. Love this product highly recommend. I suffer from dry skin and have trouble with finding a foundation that can give me a nice natural glow. 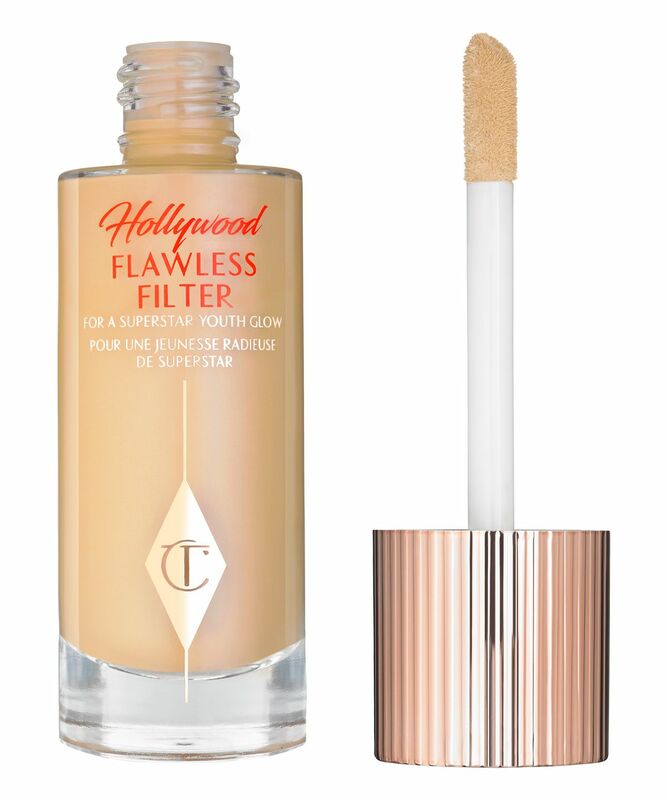 Enter Charlotte Tilbury's Hollywood Flawless Filter. This has absolutely changed my foundation routine. I mix the flawless filter with my foundation and then apply to my face. My skin has never looked better! The only caveat is that I am not a fan of the applicator and would prefer a pump. Other than this, it is well worth the price, this is an AMAZING product. Thank Charlotte Tilbury for making such this incredible product. If you want a product that will give you an effortless ethereal glow? Then you've come to the right place! This product is simply beautiful and wears like a dream, I'm finding myself reach for it in favour of my Estée Lauder VB Morning Aura. It really does give you a glow that would outshine Helen of Troy. I wanted so much to give this a 5 star (the product inside deserves it) but the packaging is a let down (as beautiful as it is), the doe foot applicator is a big NO in my books (bacteria build up? No thanks). Having to sanitise the applicator after each use is a tad inconvenient (not to mention excess product waste). Like many of the oils/serums etc. I use, I really wish that this would come with a pump. So in the spirit of Withnail and it being 2018 and not 1998, "We want the finest pumps available to humanity, we want them here, and we want them now!" Amazing product. I have oily skin but I still feel that this adds a very natural and healthy glow without being too oily. I use it with the Flawless Finish powder from C.T. which is also great. I like to do it on my face especially on top of cheekbones and nose. I love it, no shimmer, glow natural and radiant, very good! Amazing! Mix it with your foundation or just apply to wherever you want some extra glow! You also do not need to use much product to get glowing results. Was dying to try this. I used it as a primer with my usual foundation on top. As soon as I applied my usual foundation my skin took on an orange colour. However, after a couple of minutes, the colour settled down to my usual skin tone. My face looked brighter and lines were blurred giving an overall smoother look. Really like it. My search is finally over for the perfect non-glittery/shimmery dewy glow! I’ve had lots of compliments saying I looked ‘rested’ and ‘refreshed’ when I am in fact far from it! A little goes a long way too so should last a while. To change that awful packaging. I really wanted No.4 but out of desperation, I bought No.1 instead.. It looks deeper in the bottle but once applied it lightens up and I guess it is to do with the highlighting property. For reference I use Kevyn Aucoin SX05, Clarins foundation in 108, and Inglot Beautifier 104. So this is definitely too light for me on its own. However, when mixed in with foundation it is not so noticeable. It gives a subtle glow that is elegant like a sheen on a pearl. If you are looking for metallic, glitter and shiny highlighter, this is not for you. I won't be repurchasing this unless the Packaging is changed to an airless pump. OMG it is the best thing I have ever tried! Usually I don’t write reviews but this product worth it. My skin is dry and looks dry, no one primer or foundation gives me healthy glow but flawless filter made it. Thank you Charlotte Tilbury! This product is amazing, but the packaging is wired, it’s not hygienic at all, and it will be hard to get the product out in the end of it. This product is so strange. I love it, but I can't put my finger on why. It's not really shimmery enough to be a highlight, but too shimmery to be a primer. I've just come to terms with that I pack it with me everywhere for some reason, and really miss it when I don't have it. With that said, the packaging looks nice but is horrible. The doefoot applicator in a glass bottle with a tiny neck means you are lucky if you get half the product out of the actual bottle. I'm not quite there yet, but will be extremely frustrated when I see 20% being left in the bottle, with no way of getting it out! It is such a lovely product that is so versatile. I use it as a primer under light to medium coverage foundations to achieve a dewy look or under very full coverage (like Faux Filter) to get full coverage and a bit of radiance as well. It can also be used just as a highlighter on the cheeks. The applicator is quite nonsensical but it's not a huge deal - that is until I get to the bottom of the product and will have to find a way to get it out. Sadly this is another product from Charlotte Tilbury that really does not work for me. I so want to love her products, but am yet to find one. The Flawless Filter is in a very impractical bottle. I hate the applicator, as it's limiting in the amount I can dispense. I've tried the product both on it's own and mixed into my foundation. It's simply too shimmery to be considered a "natural" look - and of course I have tried to adjust the amount of product I use as well. Sorry, I cannot recommend this one. I don’t normally write reviews, in fact I don’t think I ever have for a primer/foundation, but I feel this product really deserves recognition for how amazing it really is. I have acne prone skin which also tends to be on the dryer side, I’m also pregnant and hormones are making breakouts even crazier than ever. I also suffer from rosacea and uneven skin tone. I was looking for a product that would allow me to leave the house with minimal effort required for when the baby arrives (I’m sure I won’t have time for my usual Mac full coverage and bake routine every time I leave the house soon), but also something that hides some of my hideous skin. This product does just that, it adds a light dewy glow with a touch of colour that blends seamlessly. It makes my skin look so natural and glowy like I’m not wearing any makeup at all. I literally just wear this with an IT cosmetics translucent poreless powder over the top to set and my makeup routine is complete. Of course it doesn’t cover all blemishes like a full coverage foundation would but it certainly does a great job of making it look a whole lot better. This product really is everything and looks great as a primer under a full coverage look too. If you haven’t bought this yet, you should! The victoria secret model glowing, flawless, lit-from-within, no makeup look in a bottle. everyone compliments my skin when i wear this. can be worn alone, under foundation, or mixed in with foundation. Highly recommend. Absolutely love this product, makes my skin look so glowy and healthy it’s amazing. I will definitely be buying again!! Me ha encantado!!! Es un producto de 10!!! Estoy enamorada de él. *** I loved it!!! It is a product 10 out of 10!!! I'm in love with it. Deja un brillo precioso, sin glitter, sutil pero que se nota, muy elegante. *** It leaves a beautiful shine, without glitter, subtle but it shows, very elegant. I’m a mixed race girl with combination skin and was fed up of matte look foundations. I watched a few of my beauty bloggers rave about this so decided to give it a go and I wasn’t disappointed. You can wear alone or under foundation! It wizardly and I’ve no words to describe what witchcraft good ole Charl has pulled off here! Buy it guys I promise you won’t be disappointed! I’m an NC42 at Mac and brought shade 5 but probably could have gone with shade 4 as it blends out perfectly. Gives a natural beautiful glow. I mix it with foundation and dab some over my foundation, love it. For reference I'm a NC 40 and picked the shade tan which is a prefect match. It's so amazing!! I love the glam and cant live without! I will use it all time. I absolutely love to use this product under foundation and concealer. It’s gives such a beautiful glow to the skin. I have a fair to light skin tone and the shade 2 is perfect for me. I can’t imagine my makeup without it. The only downside is that the packaging is too heavy to travel with. I can see why everyone's been raving about this product. It gives you a dewy, "lit from within" glow in natural light with very slight coverage, and when I wore it on a night out, it gave my skin a beautiful candlelit glow. I've recently gotten a bit of a tan, so I'm thinking of purchasing another one in a darker shade. My only complaint is with the packaging - it's a bit messy and you can end up losing product every time you open and close it. Beyond that, I love CT products, and this one did not disappoint! This gives me the best 'lit from within' glow all day/night long, I absolutely love it under foundation. By far the best makeup product I’ve bought in a long time. I don’t like to wear foundation so it’s just perfection for me. Lightweight and blends like a dream, looks flawless but still looks so natural and let’s my freckles show through, obsessed! I have to say, it has become my favourite thing for my base. I put it all over my face and just add a bit concealer, where needed, blush or bronzer and I am good to go. Gives a goddess like glow on the face and as it says on the box - flawless filter - it is true. Natural, glowy, youthful looking skin. Very light coverage. Perfect on its own, or on top/under of foundation. I have sooo many liquid highlighters/ primers but this is the best! It blurs and highlights and sits well under foundation. I put it all over (except nose as I get oily there!) and it looks glowy and gorgeous! I am light (2n1 estee, nc15/17 mac) and choose shade 2 as it was more golden. Love it - I glow. I got this one just after the new year. I was a bit skeptic how my dry areas would look and if it would sting. No problems, no sting and makes my skin look more healthy! Just amazing! I use #01 Fair. I'd like another colour because it looks soooo beautiful!! Got this for Christmas and I really like it. It is a very versatile product and looks lovely on the skin. Really enjoying using this with the contour and highlighter wand. I LOVE this product, there's nothing similar in my opinion. Good job, Charlotte! Can be used under foundation, over foundation or mixed in with foundation. Gives a beautiful glow, covers pores. I get lots of compliments on my skin since I started using this. I also think its one of the better value for money products from CT - one bottle lasts a long time. It gives you the most stunning natural glow. Hollywood Flawless Filter makes my skin look so healthy and glowy, it's one of my favourite make up products invented in the history of make up, aside from mascara and lipstick. It's at a high price point, but I wear it almost every day and it's lasted me 5 months. Any dregs I have left I've just added a couple of drops of rose hip oil to gather it up so you really get your money's worth here. It makes my foundation apply like a dream with its silky consistency. I also wear it on top of my make up for extra glow. I got Hollywood Flawless Filter in March 2018 so I had time to test it. I love this product. I use it under my foundation, as a highlighter and mixed with foundation. I have large pores and oily skin in T-zone but it works for me very well! It gives my skin a very luxurious look! It’s my must have, will buy again. It is literally how the Charlotte Tilbury models look. It gives that plastic skin look and it looks just wet and healthy. I’m lost for words. Guys this is my favourite makeup product at the moment, I mean I have combination skin and this product just makes my face glow without making it look oily like other products and it looks good under foundation and on it's own, hands down the best. I apply it under my foundation on the spots I want to highlight and gives a great shine from within. GORGEOUS! First off, the packaging is so pretty. The bottle feels heavy and expensive, and I hate products that make me wonder why I paid a fortune for what feels like nothing so that was very reassuring. It gives you such a pretty glow on its own or really helps brighten under foundation. I love it! The whole JLo-in-a-bottle thing is so absurdly true. This is just so......I don't know what to say! The glow is out of this world! And it's so realistic, unlike those highlighters that make you shine so much you look sick. I've been recommending this to friends and when they ask me what exactly is it? I'm like I don't really know! I don't know what to call this! I'm sure Charlotte Tilbury didn't know too coz that's why it's called a filter! It's not a concealer, it's not a bb it's not highlight nor foundation! It's best on its own with a touch - just a touch - of tinted moisturizer! And it's so beautiful. Makeup in this era is very game changing but this filter is groundbreaking! I've never come across anything like it before. This is my first ever CT product! And I'm crazy about her and her makeup sensibilities. This is beautiful. This makes anyone’s skin look airbrushed. I was sceptical because I have some texture on my skin but oh my god mine ends up looking lit from within. I use it all over under foundation and over the top in the high points and it is just so so beautiful! I was sceptical before I purchased this, but it has completely delivered. I use it alone and my skin looks radiant and healthy. Love it. I absolutely love this product. It makes my skin flawless when I wear underneath my foundation and I also use to do a subtle highlight on top. My favourite Charlotte Tilbury product! I don't know how I ever lived without it. My face looks dewy all the time—and I've received endless amounts of compliments. I apply the product onto my skin after moisturising. It's not heavy, greasy or sparkly. In fact, it looks very natural and gives my face a natural glow. The only con is the doe foot applicator so could be a hygiene issue. I'm finicky about these things, so I swipe it onto the back of my hand before applying to my face. Will need to buy many more bottles of this (yet at the same time, want to keep it a secret from everyone else)!